During the adjournment, the Bristol Alliance, in consultation with planning officers, revised the plans. The Brunswick Square access is abandoned, customer access to the car park will be via a new light controlled junction from Bond Street. A new pedestrian link from Bond Street is included. The parking spaces are reduced from 580 (originally 1,000) to 380 spaces. The new perimeter blocks on Bond Street and Merchant Street will be lower, which the Society had proposed throughout the planning process. The Society was pleased to support the planning officers who have achieved these revisions. Now that the Council has approved the Cabot Circus extension, will the Secretary of State refuse to approve the Cribbs Causeway Mall extension? The Society will continue to review the scheme as the detailed plans evolve. 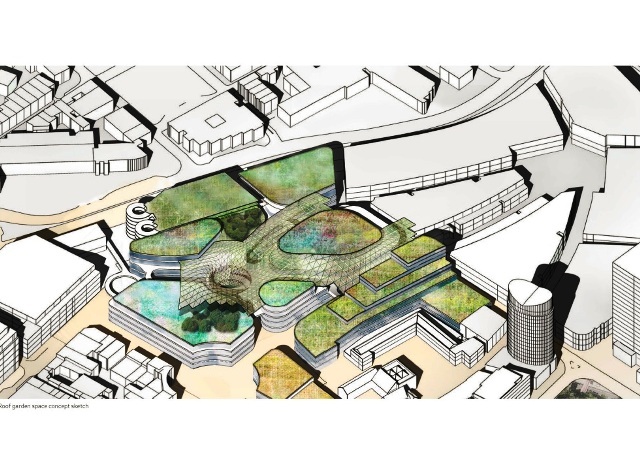 The image shows an aerial view of the outline scheme with green roofs. The image indicates the potential scale and character. The extent of this outline planning application is difficult to understand. The developers are the Bristol Alliance, a partnership between the retail landlords, Hammerson and AXA. The Alliance proposes a comprehensive mixed-use redevelopment. The Society welcomes and supports the scheme, which offers Bristol more than a defensive response to the proposed extension of the Cribbs retail park. These are the headlines. The Alliance proposes to demolish virtually all the standing buildings east of Merchant Street, and south of Bond Street as far as Philadelphia Street. The Nationally listed group of buildings around Quakers’ Friar and the locally listed Broadmead Rotunda would remain. The Alliance proposes a 12-floor block of flats on the Bond Street boundary. The tower would be subject to a Tall Buildings assessment of its impact on the cityscape. Broadmead contains the Eclipse, the 18-floor tower above the Harvey Nicholls. The Society’s major concern is about a new multi-storey car park. National and local planning policy aims to reduce traffic in towns to decrease congestion and improve air quality. There would be additional traffic lights in Bond Street at the car park entrance, which would interrupt bus and Metrobus traffic. If the Council is satisfied that the Alliance cannot support the volume of retail and leisure expansion without more car parking the alternative is to expand one of the existing multi-storey car parks. The Alliance could build more homes if the car park is left out of the development. The proposed car park is now 580 places, with a different access arrangement to reduce the disruption to Bond St.